May 19th, 2011, CAC presents the first Columbia City Art Walk, called Artisan Alley. In keeping with the notable diversity and distinct traditions and backgrounds Columbia City is known for, Artisan Alley allows for an art experience different than any other in Seattle. Beyond traditional visual arts, the Columbia City art walk will also offer participants the opportunity to enjoy and experience the sounds, feelings, scents and tastes of artistic creation as it is expressed through music, performance, spoken word, dance, and food. 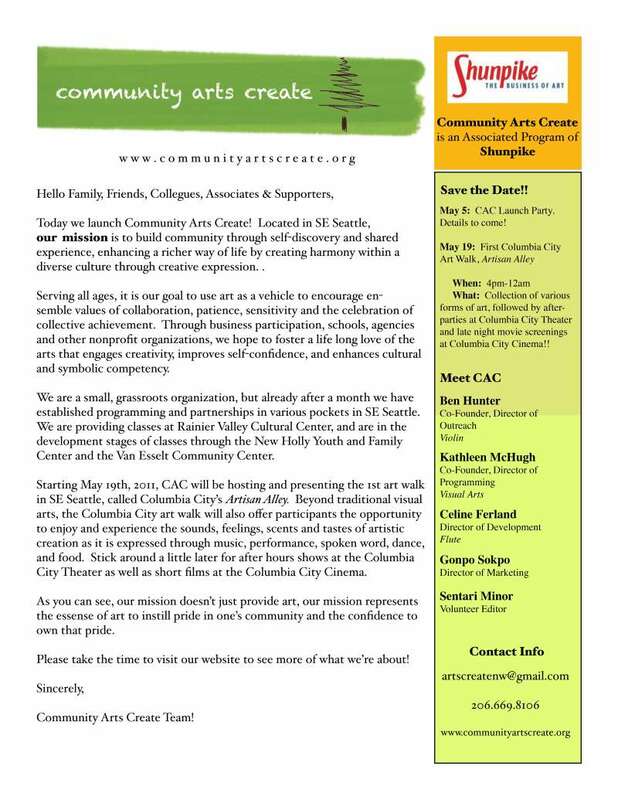 Please visit our website at communityartscreate.org and see what we're all about. 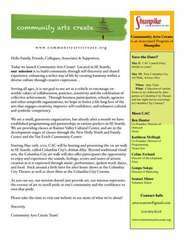 Community Arts Create is a collective of visual and performance artists dedicated to the gift of arts. We believe that art is a living, breathing, changing, amorphous being that can enrich, inspire and enlighten lives while building a healthy community. Our mission is to build community using arts projects, programs and the power of collaborative creativity. There is a real need for arts programming in SE Seattle, not just for youth, for for all ages. While there is plenty of housing and business development going on in the SE district, there is still a long way to go for social and artistic programming development. Community Arts Create is here to create a place for fusion and a hybrid experience. Settled in the vibrant amalgam of cultures, traditions and histories that is southeast Seattle, we've developed the perfect avenue to demonstrate and highlight the dynamic nature of art, and the crossbreed that occurs when you open yourself up to the possibility of anything! Community Arts Create wants to build on what we call hubs, and by default, a collective of alchemists devoted to mixing it up and seeing what happens…ie, the "folk skeleton". Folk art represents the shift in ideas from one body to the next. That fluid transfer constantly rebuilds and repositions itself to infinity. CAC is just one of the transfer centers.